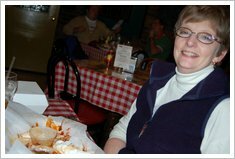 Friday, Gayle and I headed to Memphis. Since the expo was right off the Interstate, we stopped there before checking into our hotel. We picked up the race packet and spent some time walking around. I did find a deal on my model of Asics so I pick up a couple of pairs. After checking into the Residence Inn, we walked the two blocks to Auto Zone Park to see where things were for Saturday and Gayle and I could get an idea of where to meet up after the race. 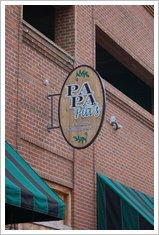 Friday evening we met Joe and Darrell for supper at Pa Pa Pia’s, an Italian restaurant that was a block away from the hotel. We had a great pre-race meal and it was good to catch up the guys. One of the topics of discussion was what to wear for the race. The forecast was for the upper 20s at start warming to 50 by noon. But the wind was going to be a factor. The consensus was to layer and and throw away as needed. Saturday morning it was 34 degrees at 6 am and overcast. I knew I was going to wear shorts but I had trouble deciding how heavy the upper layers should be. I finally decided on a long sleeve shirt and a short sleeve shirt on top, cotton gloves, and a light skull cap to keep my ears warm and a ball cap. When I walked out the door and headed to the ball park, I could see that the 5k had already started. The runners were going up the street that separated me and the ball park. I waited for a slight break and cut across. I felt like frogger in the old arcade game. Took off my warm up pants and put them in the gear check bag but decided to keep the skull cap. I needed it to keep my ears warm. Just as I had checked my bag I ran into Joe and Darrell. They checked their stuff and we headed over to the starting line. The corals were already filling up so we wished each other well and headed off to find our places. I found the 4 hour pacer in coral 6 and settled in to wait for the start. I introduced myself to several folks. Needed to make some new friends, since we were going to send the next several hours together. Met a couple of guys for Nashville and Murfreesboro. Also, met Carlie from Birmingham. 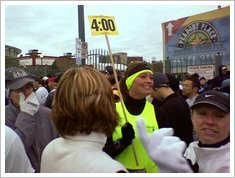 This was her first marathon. The race finally started but with the staggered start, our coral was not released up till about 9 minutes after the gun. With 8,000 running the half and 3,000 the full, it was rather crowded. About a mile and a half we turned onto Riverside Drive. It was one of the coolest sights. We were at the top of the hill looking down on the Mississippi River with all these runners on the road beside it. We soon turned on the Beale Street and after crested the hill, was serenaded by an Elvis impersonator. How fitting. There were several other bands on the course and the song of the day was Sam & Dave’s “Soul Man” made famous by the Blue’s Brothers. We turned onto Third and I saw Gayle about mile 3. About mile 4, I had warmed up enough to toss my sweat shirt. We made the loop out and back and dropped off the half marathoners at mile 12. It was good to finally have some space to run. We ran back down Beale Street before heading East again. By this time the 4 hour group was getting smaller. We were hitting our splits and in fact were just a little a head. But by mile 19 our group was down to three, Carlie, me and Amy from Paducah, Ky.
Just before mile 21 we made the turn to head back West toward the Finish line. This part of the course doubled back on mile 5, 6 and 7, so we knew what to expect. We had two pacers in our group, Laurie was the lead and a guy who was at the back of the coral. 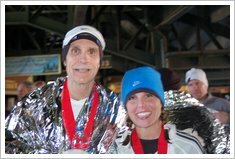 We had stayed with Laurie, until about mile 22, when Carlie asked if Laurie had sped up. Carlie and I stayed together but Amy had dropped back. I was a few feet ahead of Carlie around mile 24.5 when I heard her say, please don’t pass me to our other pacer. He told her that he was about 40 seconds a head and just to keep him in sight. Soon after that Carlie, passed me. I was running out of steam. About mile 26, Amy caught up with me and she pulled me in the rest of the way to the finish line inside the park. It was a new PR, 4:01:52. I beat my old record by almost 10 minutes. After I got my blanket and medal, I spotted Gayle in the stands. As I made my way from the field Carlie was waiting by the gate to the stands, she wanted me to meet her husband and take a picture. When I got to the concourse, I Gayle snapped another one for me. The concourse was cold! I went and got some food but was quickly getting chilled. We pick up my gear and Gayle helped me put on my warm up pants. That helped but with the wind and the wet clothes, the blanket didn’t help much. We shuffled the back to the hotel. It was good to get inside where it was warm. I got out of the wet clothes but it I was just shaking. It took a good 30 minutes to get warm. After that, there was NO WAY I was going to take an ice bath! The warm shower felt good but I knew my legs would suffer. After I got cleaned up we checked out of the room and then headed to Rendezvous for Barbecue before heading back home. This entry was posted on Sunday, December 7th, 2008 at 8:22 pm	and is filed under Race Reports. You can follow any responses to this entry through the RSS 2.0 feed. You can leave a response, or trackback from your own site. What a terrific improvement, Congratulations. It is very neat that you met Carlie and were able to find her again at the end. She did well on the first time out there. Rendevous was on our recommended list, but we went to Alfreds instead (also recommended). I had a nice time chatting with you and Gayle over dinner. 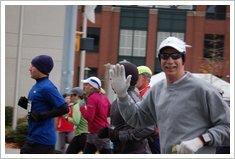 Keep up with your solid training and the BQ will fall into place at the right time. You always look like you are having so much fun during a race. Congrats on the new PR!!! Great report, David!!! I’m so happy you got such a cool PR; though I know you were hoping for a sub 4. You were close! It was so cool to have dinner with you and Gayle on Friday night…I sure enjoyed that a lot. Thanks for the time…it was terrific. Give my best to Gayle. congrats on the PR, that is HUGE!!! I was cheering for you all morning from here. You will get that sub 4 and a BQ soon. Sounds like the concorse WAS your ice bath! Burrr! Loved the description of Frogger! GREAT race report and congrats on the time!!!! That is an AWESOME PR!!! Congrats!! A tip of the running cap to you, David. You did well. I enjoyed the report.